This mansion dates from 1800 and is located in the historic centre of Saludecio. It consists of 3 floors. On the two upper floors is the night area with lovely and spacious bedrooms and the living areas are on the ground floor. A spacious living room with kitchenette where you can exit onto the beautiful characteristic terrace where you can view the Adriatic coast. The terrace is right across from Saludecios park. An ideal place to sun yourself, read a book or dine and chat until late while enjoying a lovely glass of wine from the local vineyards. The house is decorated in style. 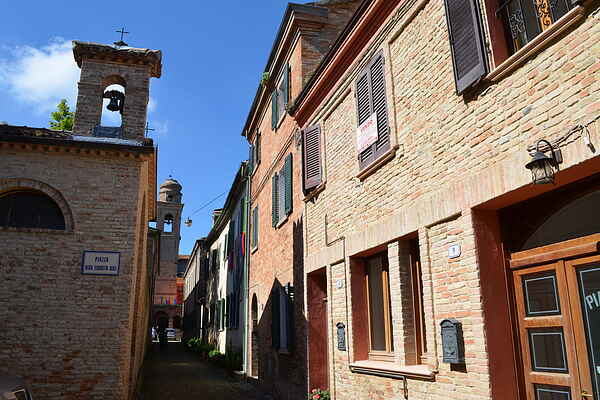 Saludecio is a village in the hills of Romagna where time seems to stand still. The murals gracing many gables are unique in this village. From Saludecio there are many possible excursions, it is only 15 km from the sea and San Marino and Urbino are not far away. The house is a short distance from Mondaino and Montegridolfo, two small villages with a historic centre like Saludecio, but still very different.